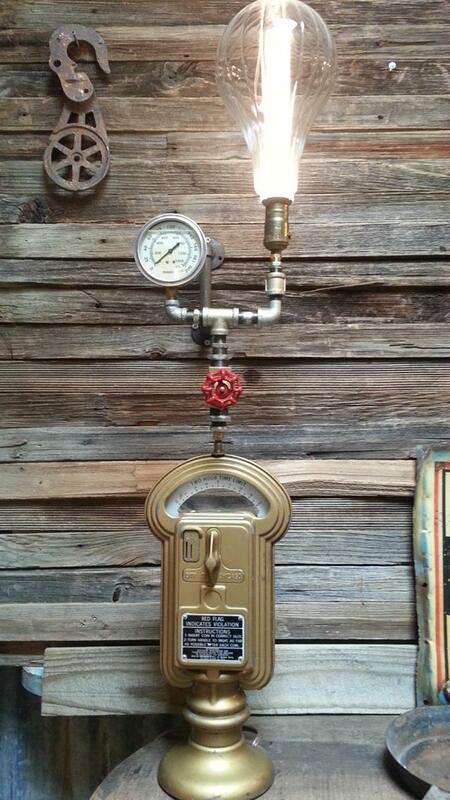 Parking Meter, Reclaimed as a Steampunk Lamp for your home. This IS cool. 3 Feet Tall. 9 Inches Wide. Gold colored base (parking meter head unit). Includes vintage style filament bulb (balloon bulb). Working lamp with fully functional red valve switch (you turn it like a valve, it acts like a switch). Vintage, Oil Filled Pressure Gauge (psi, oiler). Pipe fittings for stems and stalk. 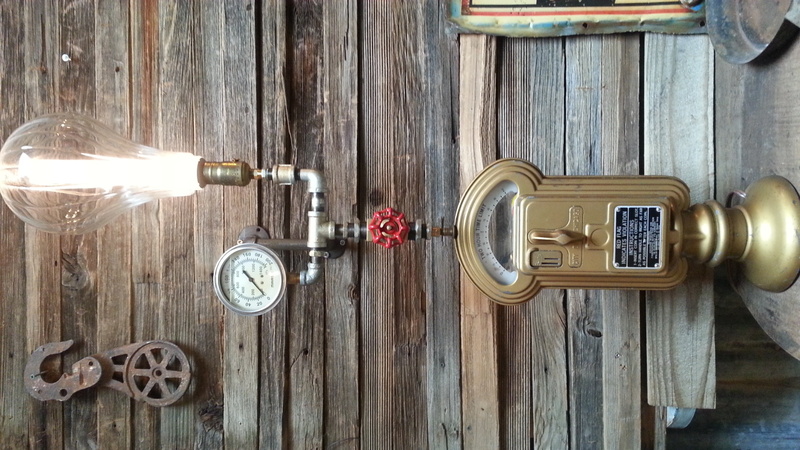 This awesome one of a kind piece of steampunk lamp art is made from a vintage parking meter (violation meter still works when you turn the knob) that...wait for it...TOOK PENNIES! So no need to go into how old this is as you do not remember buying anything for a penny much less paying for parking with them. This is a conversation piece to say the least. This is actually cool and you cant get it anywhere else at this price, so read on. You can get it in store for a discount if you know the secret coupon code (say "redneckery" when you're about to buy in the store or type it as the answer to buy online). If you mention the code you can buy this for 10% off, that will save you nearly $50 bucks just because you were smart and read this description. It pays to pay attention to the Steampunk Specials. Also, if you read this far then we know you're online but may not be able to come into the store to get the discount, so CALL US (775-329-6422) and say it. We will be very happy to talk to you on the phone and get you this awesome lamp. We ship worldwide and it will not cost you an arm or a leg. If you are absolutely serious and you cant wait or cant call then shop online right now and pay via PayPal. Simply type the secret word using this form right HERE. A right answer will get you to the checkout area. Save almost $50 USD, woot! Constructed with pride by Micano Home and Garden Center in Reno, Nevada.